This little doggie can’t wait to tap that… Keg. Done with copic marker, liner, and paint pen this guys collar mimics the keg he’s standing on. There weren’t a lot of questions about color with this one. The keg was a specific color, the dog is only this color. Only real color choice was collar and I could have done this pic without. In fact most of these aren’t wearing any clothing options. So why does this one? It really brings the two parts of the picture together. 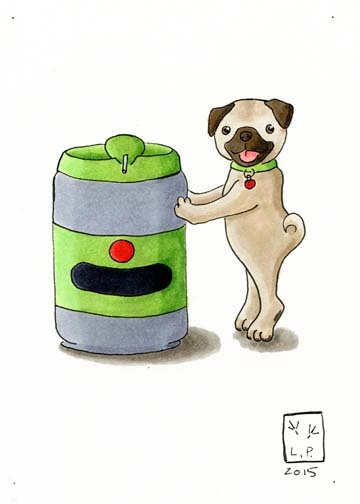 That and it says this pug is just crazy for this keg mmmmm.